Passiflora edulis, queen for a day in October 2010! – our garden queen for just a day! Woo hoo! 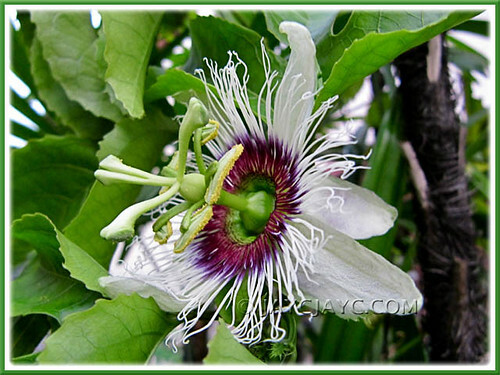 How marvelous…our Passiflora vine had finally flowered for the first time in mid October 2010 after a 15-month wait! John and I are absolutely thrilled! As a potted seedling at our backyard, back in July 2009, it had matured steadily though a little too straggly due to lack of proper grooming by us! Nevertheless, though the vine is not as beautiful as we’d hoped for, it had produce a classic passiflora floral beauty, a solitary flower with eye-catching colour, design and structure. How wonderful to be able to delight in its exotic beauty live and be able to capture its beauty on camera too! Fact is, we would have missed out on this blessed event, had my darling John not looked up the 7-foot tall Lady Palm tree that the vine was draped on and spotted the fabulous flower that late evening, almost dusk actually! That too, he had to bring the stem lower to eye-level to admire up-close and enable me to photograph it as well. The Passiflora edulis produces lovely white flowers, each about 6.3 cm diameter, consisting of 10 white tepals of which 5 alternating tepals have greenish underside, and a large corona that’s fringed with frilly white-tipped filaments and deep red/purple at the base. Also, centrally located and prominently seen is the ovary, 5 stamens with large anthers and triple-branched style! Absolutely spectacular! We were hoping to admire it once more the next morning but shocked to find out that the flower had ‘closed shop’ for the day! Aargh! Had wished too to see if it will fruit eventually….checked a week later and found it had disappeared. Humph, no trace at all, presumably the work of the scavenging monkeys! Though the exotic bloom was queen for just a day, blooming beautifully and remaining open for just one day and gone the next, it’s most fulfilling and exciting to be able to view its flower live which then enabled me to google for its identity too! So happy that we’ve finally nailed its name! Passiflora edulis, native to South America, is one of the most widely cultivated Passionfruit species worldwide because it yields edible passion fruits. We praise and thank God for little miracles like these in our tropical garden that give us our daily dose of cheer and joy! 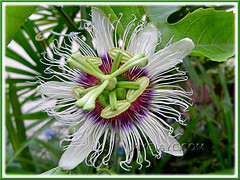 congratulations on your beautiful passionflower! it is such an unusual flower. i hope it fruits for you, too. Oh I am sure that you will get plenty more flowers and then fruit. This looks exactly like my passionfruit flowers. Dont they smell divine as well? Passion flowers are lovely. Soon you’ll be rewarded with passion fruits. Dariciq – thank you so much! Gillian – We truly look forward to its bountiful flowers and fruits. Didn’t know that the blooms are scented…will keep this in mind when it flowers the next time around. Thanks a lot. Autumn Belle – We hope so too! Thank you. Hi Jacqui, i have not been here for sometime, sorry. 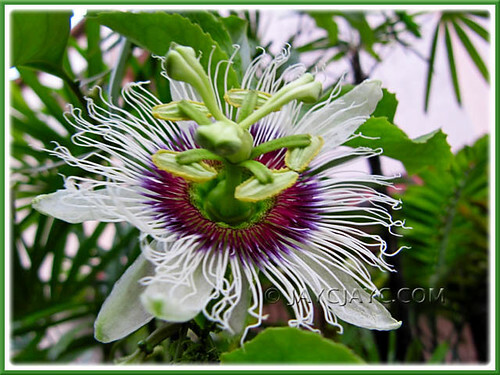 Passiflora flowers are always lovely even if it’s the fruiting species or the ornamental species. 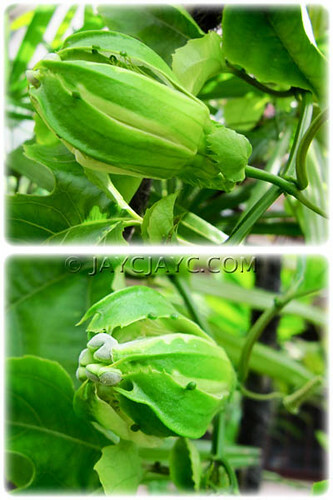 I just forgot the species fully just ornamental and the fruit is very very small and cant be eatern. Lovely to hear from you, Andrea! Thanks for dropping by.